For several years, Arofish has been using a spray can to decorate some of the most devastated and neglected areas on the planet – such as Iraq, Palestine and Lebanon. He was the first British stencil artist to deface Palestine's notorious apartheid wall. Though he rejects the term "war-zone graffiti artist", his undeniable influence on the international graffiti scene is evidenced by the legions of graffiti artists who have travelled to Palestine to paint on the wall since. 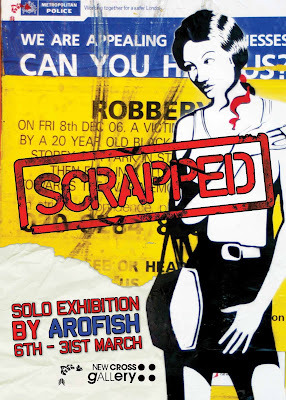 Scrapped is Arofish's first solo show in a gallery, featuring work painted on various scrap materials. This is apt for an artist whose recurrent subject matter is those who face the daily challenge of living among the wreckage without despair.